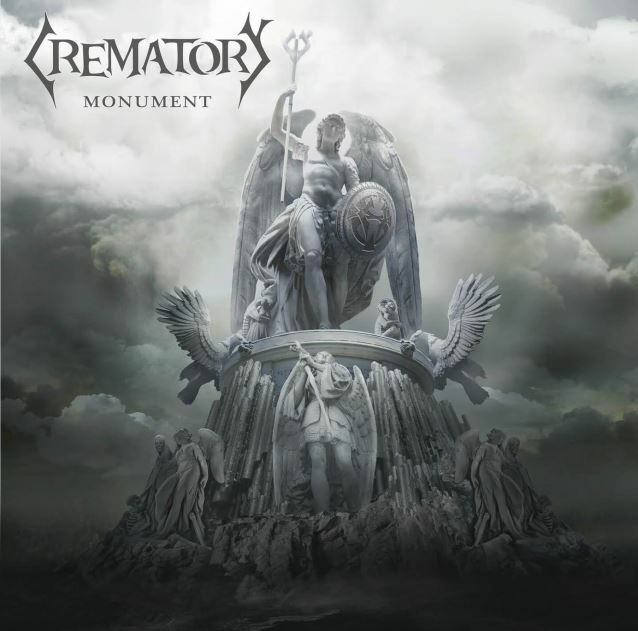 German gothic metal act CREMATORY will release its thirteenth studio album, "Monument", on April 15 via Steamhammer/SPV. Infinitely more strongly than on its predecessor, "Antiserum" (2014), the twelve tracks on "Monument" are based on brute guitar riffs and hard-as-nails drum grooves, replete with sinister keyboard hooks and that mix of growls and clear vocals — some in English, some in German — that is so typical of this band. The group's fans will be thoroughly delighted with "Monument" and its dynamic sound. When the work on "Monument" commenced in spring 2015, a personnel issue had to be settled in the CREMATORY camp: Matthias Hechler, guitarist, clear voice and a style-defining member for 17 years, had left the band for private reasons. That his departure went off without animosity or internal quarrels was confirmed by Matthias in an interview on the "Live At Wacken 2014" DVD. Following his decision, CREMATORY made a virtue out of necessity, enlisting two successors: Tosse Basler (SCAPEGOAT, AVALANCHE) joined the fold as rhythm guitarist and clear vocalist, and Rolf Munkes is CREMATORY's new lead guitarist. "Tosse and Rolf have brought a breath of fresh air to the band. They've really inspired us with their powerful style and phat guitar sounds," rejoices drummer Markus Jüllich, who composed the songs again with producer Kristian "Kohle" Bonifer before going on to produce them together at the Kohlekeller Studio. The result is a gothic metal opus that positively bursts with energy, featuring twelve diverse numbers with different degrees of toughness, including double guitar parts and guitar solos. The opener, "Misunderstood", which is supported by the first video release, is probably the most metallic number of CREMATORY's career. Markus refers to the track as an "ideal introduction, not only to our new album but also to our upcoming shows." The ballad "Save Me", which Jüllich/Bonifer wrote some time ago and have now approved for release in view of the new lineup, presents a stark contrast. "As far as I'm concerned, this number has an orchestral flair," Jüllich reckons. "It suits Tosse and his timbre perfectly." Talking of which: because of their new team, CREMATORY have honed the homogenous blend of frontman Felix Stass's raw growls and the clear voice of their new band member Tosse Basler even more finely than ever before. The album carries its symbolic title with justification and the twelve impressive songs are undoubtedly a real monument to this group's amazing creative powers. In line with this, the cover artwork is both classy and sublime: for the third time in succession, CREMATORY, worked with Hungarian artist Peter Sallai. As in the productional collaboration between Markus Jüllich and Kristian Bonifer, the band has relied on tried and tested collaborators without repeating or indeed copying themselves.